Americans really enjoy their National Parks, especially in Summer months when the Sun is shining, and the days are longer. But, a trip to a US National Park during peak Summer months also means crowds, high prices for lodging and sharing the trail with lots of people. But when snow starts to fall in these wild places, fewer people visit them. Understood, Winter brings short, cold, unpredictable days, road closures, and fewer accommodations. But, do not put a National Park adventure on hold for the Winter, know that there are still plenty of opportunities to explore them. Winter is 1 of the best seasons to beat the crowds and watch your favorite park transform into a spectacular Winter Wonderland. There are lots of National Parks in the USA, and there never really a bad time to visit 1, but the ones we feature here are Tops and will take your breath away this Winter. As snow starts to fall in Yosemite Valley and high-elevation roads close for the season, the heavily congested Summer months are over. 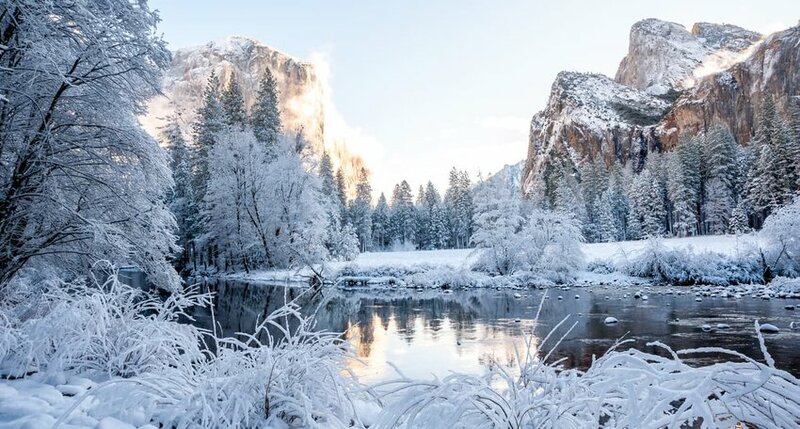 Winter in Yosemite National Park brings silence, solitude, and ample opportunities for peaceful Winter recreation. Ice-skate beneath one of Yosemite’s most iconic landmarks, Half Dome, from mid-November to March at the Half Dome Village Ice Skating Rink or grab a camera and take a scenic stroll through Yosemite Valley, where granite monoliths and meadows are covered in snow and ice. Head to higher elevations and take advantage of miles of perfectly groomed trails and slopes at Yosemite Ski & Snowboard Area. Here, find ample opportunities for downhill, back-country and cross-country skiing, as well as snowshoeing and tubing. A Winter trip list would not be complete without the country’s wildest, most remote wilderness: Alaska. Alaskan adventurers head north into Denali during Winter months for a chance to experience the extraordinary aurora borealis, take advantage of winter recreation opportunities, and take part in Winterfest, a festival that celebrates Alaska’s longest season, Winter. Snow starts to fall in the rugged Denali National Park wilderness as early as September and usually stays around until April or May. 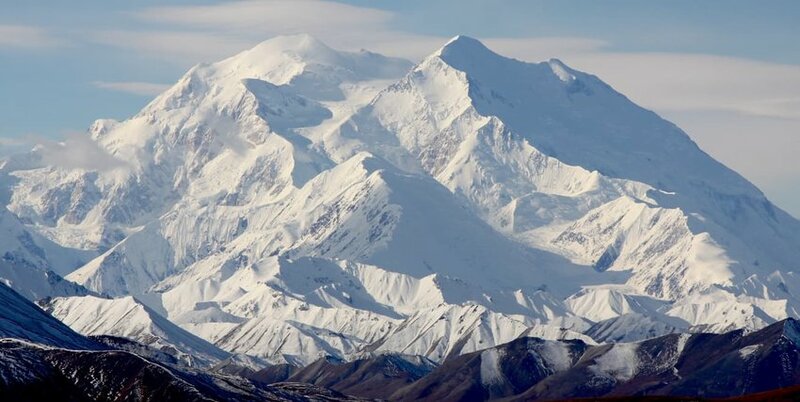 But, unlike other parks, cross-country skiing, hiking, winter biking and snowshoeing are not the only ways to explore Denali National Park. Sled dogs play a Key role in Denali’s history, and nothing says “Welcome to Alaska” quite like exploring the park with dogsled. Alaska’s locals often take their own dog team and hit the trail unaccompanied, but you can book a guided Denali Dog Sled Expedition to explore mountain passes and glaciers that are reserved for Winter months. During Winter months, Mt. 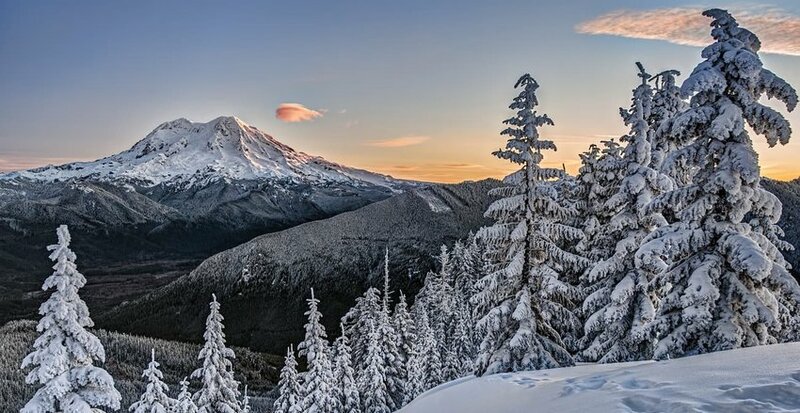 Rainier’s sub-alpine meadows and pristine valleys transform into the perfect Winter sports playground. Start the day at Washington’s largest downhill ski area and world-class ski resort, Crystal Mountain Resort. When you’re ready to begin your adventure, travel nearly 2,500 vertical ft to the summit of Crystal Mountain via the Crystal Mountain gondola and experience breathtaking views of Mt. Rainier and the Cascade Range. With over 2,600 ski-able acres and 57 runs to choose from, there is a lot incredible terrain to explore. For leisurely activity, spend time in the snow-play area at Paradise, a popular destination for sledding and tubing, or take a ranger-led snowshoe walk to learn about park plants and inhabitants in winter months. For more information on sledding, skiing, snowshoeing, camping, trails, and other winter recreation essentials, check out the Winter Recreation brochure. Beat the Summer crowds and experience 1 of the country’s most visited parks, Yellowstone National Park, as few others ever will. During Winter months most roads in the park close and snow coaches, snowmobiles, skis, and snowshoes become the primary method of transportation. In fact, after heavy snowfall, roads are open to ‘oversnow’ travel only, making a trip to famous park icons an adventure in and of itself. Yellowstone offers miles of cross-country skiing trails and ski skate routes through frosted woods and snow-covered meadows, as well as snowmobiling excursions to Old Faithful and other park highlights. 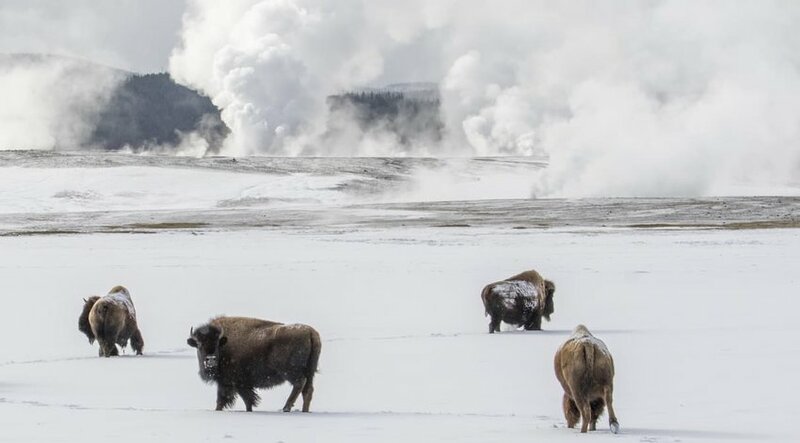 Because visitors rarely venture to Yellowstone in the Winter, expect to enjoy the natural beauty of America’s 1st national park and its abundant wildlife, in quiet. Colorado is a well-known and traveled Winter recreation destination. Make your off-season adventure plans complete with a Winter trip to the Rockies. At an elevation of 7, 500-ft, Rocky Mountain National Park is the perfect base camp for Winter recreation. 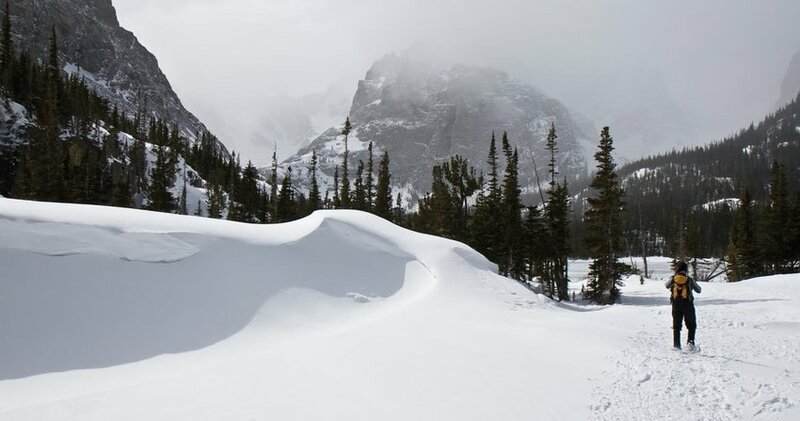 You can rent or bring along snowshoes, micro-spikes, and cross-country skis to traverse some of the park’s most incredible trails, like Deer Mountain, Dream Lake, Cub Lake, and Bear Lake Loop. Or, for less strenuous Winter activities, make the trip to Kawuneeche Valley for some quiet time observing wildlife like Moose and Bighorn sheep, or spend the afternoon tubing or sledding at Hidden Valley. If you plan to do any back-country skiing, the park does not do any avalanche control. So, always check trail conditions and avalanche activity, before heading out and hitting the trail. 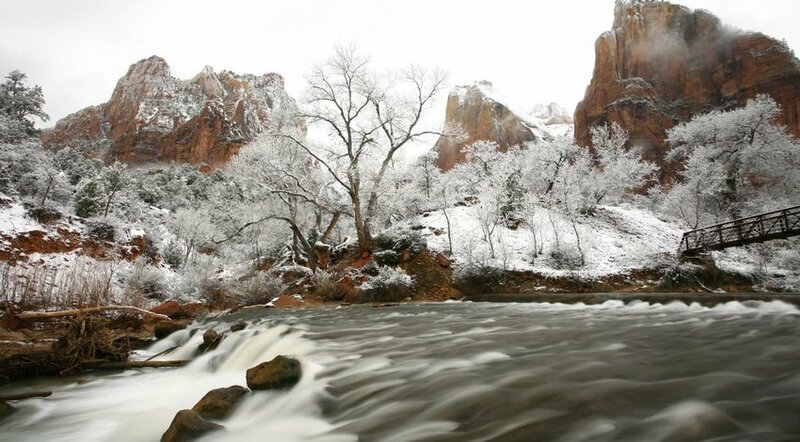 If you’re looking for Winter, but you do not want to freeze, Zion is the park. Although temperatures do fall in Winter months, Zion’s Winters are considered mild in comparison to other Winter destinations; so much so, that it’s not unusual to be able to shed extra layers for a winter hike in the park. With the park’s shuttle suspended until mid-March, you have the luxury of driving your own car up the park’s scenic road. Stop at any or all of the park’s picturesque turnouts to take in the incredible sandstone cliffs. Although the park’s low elevation generally keeps snow from accumulating on the valley floor, park icons, like the Watchman, are frequently dusted in snow, and higher-elevation trails may receive patches of ice and snow. The East Rim Trail to Observation Point and other iconic trails like Weeping Rock, Emerald Pools, and even Angels Landing are not only accessible, but are much less crowded during Winter months.